I made the most beautiful tomato pie with bounty from our garden. So many tomatoes ripened at once, I had to do something that would use up more than one or two at a time. Pie seemed to be the answer. I was prepared. I had refrigerated pie crusts, frozen puff pastry, and filo dough on hand. Using the refrigerated option seemed the easiest way to go, but that sort of crust would require blind baking, so the pie wouldn't turn out soggy. Invariably, when I blind bake a crust, it shrinks in the pan and is barely tall enough to hold the filling. I got clever this time and used a tart shell, which is already shorter than a standard pie pan. Rather than crimp the pastry or trim it while it was raw, I just let the excess dough overhang the top of the pan, which cut back on the shrinkage. I also don't have pie weights to prevent the crust bottom from puffing up. I had used rice for a while, but after several uses it started to smell bad so I threw it out. This time, I used a springform pan bottom wrapped in foil that fit perfectly within my pastry shell. It worked like a charm. For the topping, I sliced my tomatoes and salted them and left them to drain on several thicknesses of paper towel. I also blotted them periodically to get off as much moisture as possible. While those were draining, I made a filling using various things I had on hand. Now, you won't be able to duplicate my filling exactly, but you can probably approximate it easily enough. I knew I wanted to use cheese, so I combined cream cheese and feta. I wanted a savory element, so I added a few spoonfuls of bacon jam (you can use finely crumbled cooked bacon and a bit of sauteed onion), and then for balance, some vinegar. But not actual vinegar. I have a bottle of Crafted Cocktails blackberry shrub in the fridge. It has a flavor somewhat like a very sweet balsamic vinegar, so I added a couple teaspoons to the filling for a touch of acidity. You can add balsamic, but start with a teaspoon and taste before adding more, as it's more tangy than the shrub. 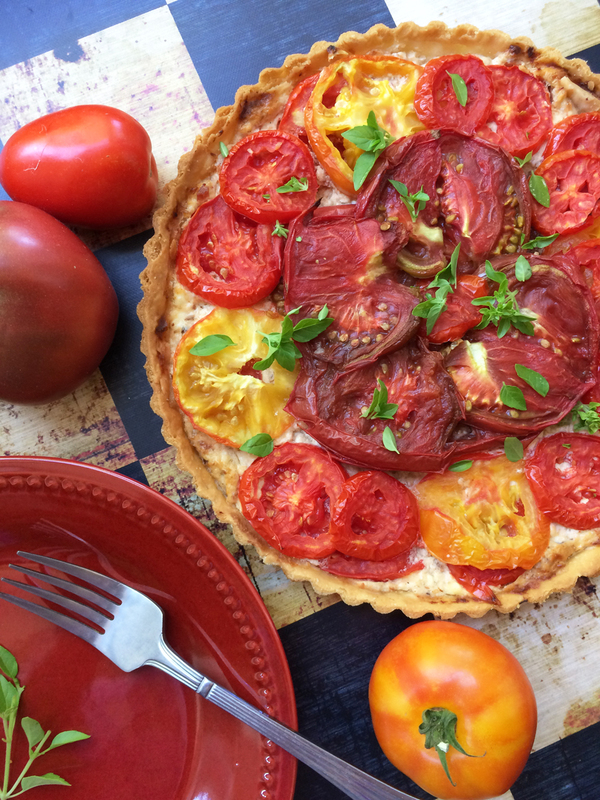 Once the pie crust had cooked and cooled, I smeared it with the filling and topped it with the tomatoes. Into the oven it went for 35 minutes until the tomatoes had shriveled somewhat and the filling was bubbling. I let it cool completely before removing it from the tart pan and garnishing it with fresh basil. It was delicious. And beautiful. Slice tomatoes about 1/4" thick and place in one layer on a double thickness of paper towels. Salt liberally. Allow to drain for at least half an hour, blotting occasionally with more towels. Fit the pie crust into a 10" tart shell with 1" sides and a removable bottom. Do not trim the crust, just allow it to hang loosely over the top of the pan. Prick crust all over with a fork. Line the crust with aluminum foil and weigh down with raw rice or beans, or pie weights if you have them. If you don't have any of the above, take a 9" springform pan bottom, cover with foil, and place within the crust. Bake for 8-10 minutes, until the crust starts to turn golden. Remove the pie weights or pan bottom and foil and bake an additional 5-8 minutes. Remove pie shell from oven and cool on a rack. Once cool, use a knife to trim the excess crust flush with the top of the pan. In a small bowl, combine the cream cheese, feta, bacon jam, and shrub. Stir well to combine and add freshly ground pepper to taste. 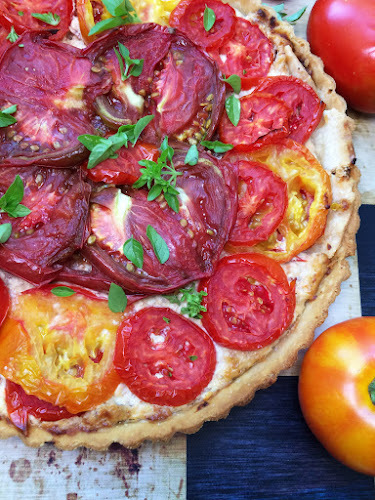 Smear onto cooled crust and top with drained tomatoes. Bake for 30-35 minutes, until filling is bubbly and the tomatoes have shrunken a bit. Allow to cool completely before removing from the pan. Garnish with fresh basil, cut into wedges and serve.